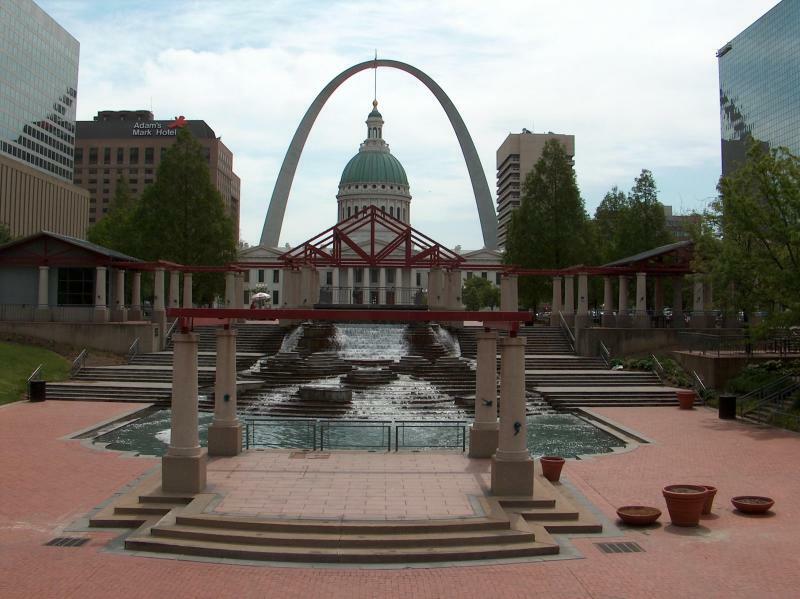 The city of St Louis, dramatically situated on the western bank of the Mississippi River, has long been seen as a gateway to the West. It was the realm of fur traders before the settlers began to congregate here, in preparation for their journey to the new lands, acquired by the US in the Louisiana Purchase. Wagon Trains formed here, and the Pony Express originated not too far away. The city has, of course, grown up from these earlier times, but there are many reminders and memorials which eloquently recall these historic events. My walk begins at the Jefferson National Expansion Memorial, a vast park on the Mississippi riverfront, at the eastern end of Market Street. This is the home of the glittering, stainless steel Gateway Arch, symbolizing this embarkation point for America’s westward expansion, during the 19th century. The 630-foot high silver parabola dominates the park. 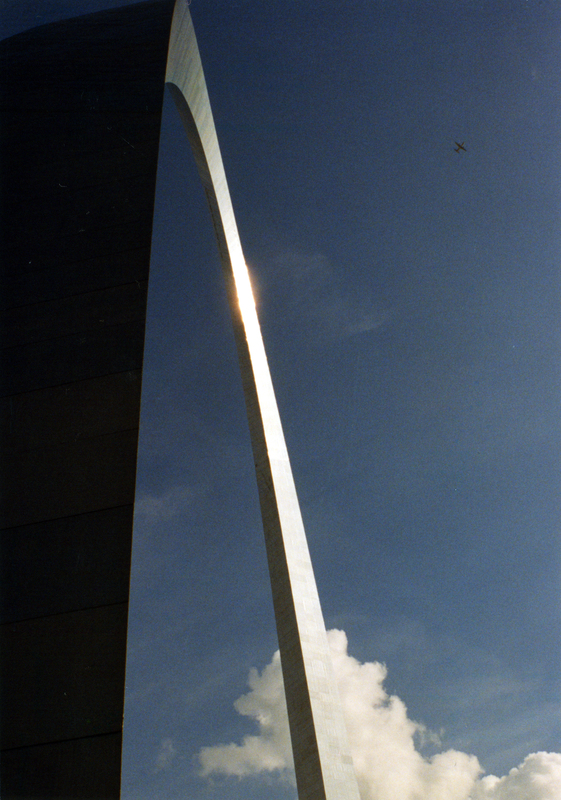 It was designed by the famous architect, Eero Saarinen, and built in the 1960’s. Visitors can ascend to an observation deck in futuristic pods (not for claustrophobics). The Visitor Center, below the arch, offers several films. Also on the grounds is the Museum of Westward Expansion, devoted to this pivotal period in American history. Nearby, a bit south of the arch, at the eastern end of Walnut Street, is the Old Cathedral (the Basilica of St Louis, King of France), an 1835 structure. From here, walk west on Market Street and turn right on 4th Street to see the Old Courthouse, famous as the location of the Dred Scott slavery trial. Walk west from here, into Kiener Plaza, to get a great photo of the courthouse, framed under the curvature of the arch. A tourist information office is also located on the plaza. Continue west on Market Street, and turn left on S. 8th Street, to reach Busch Stadium (actually at 700 Clark Street), long-time home of the St Louis Cardinals baseball team. Nearby is the International Bowling Museum & Cardinals Hall of Fame. Now, walk west on Clark Avenue, to 12th Street, and turn right. City Hall is on your left, and just beyond it is Soldier’s Memorial Park. It contains the Soldier’s Memorial Military Museum. After your visit, continue westward on Chestnut Street, which bisects the park, to reach another park, Aloe Park, which features the dramatic fountain, Meeting of the Waters, created by Swedish sculptor, Carl Miller. Next, walk north on N. 18th Street, and turn right on Locust Street. Several blocks ahead, on the right, is Campbell House Museum, former home of a successful fur trader. The museum takes visitors back to a time (1880’s) of Victorian splendor. Turn right when you reach 14th Street, and then left on Olive Street, to admire the beautiful Italian-Renaissance-style St Louis Public Library. Now, turn left on N.13th Street, then right on Locust Street, to visit the Christ Church Cathedral, one of the first Protestant churches built west of the Mississippi River. Continue east on Locust Street, and then turn right on 9th Street, then left on Olive Street, to pass by the Old Post Office, another city landmark. Next, turn left on 8th Street, and then right on Washington Street, which leads to a restored section of the early St Louis settlement, known as Laclede’s Landing. 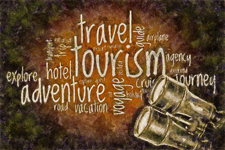 Wander around the cobblestone streets of this historic area, checking out the many shops and restaurants, before turning south, into the Jefferson National Expansion Memorial, where your walk began..